MADE IN USA - FULLY ASSEMBLED! A favorite among hobbyists, antique car, and motorcycle restorers! With all the features of our famous 960 Pro Blaster, Model 966 Pro Finisher boasts an extra-high 34-1/2" rear inside height. This makes blasting tires on rims, fenders, transmissions, headers, or motorcycle frames FAST and EASY! Also features big 12" x 33" tempered lens with inner lens protector, two 90 watt floodlights for improved visibility, two 11 gauge steel doors for easy loading and unloading, and our quiet Vac-50 HEPA Vacuum for dust removal within the cabinet. Easy to use: just insert part through either side-loading door and press foot pedal. 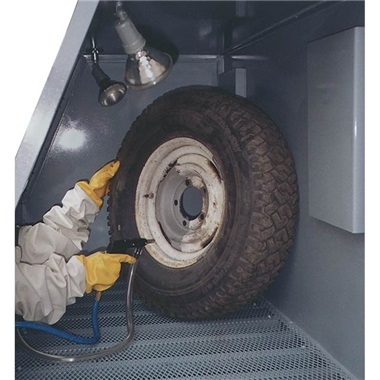 C-35 Foot-Pedal-Operated Power Gun removes rust, paint, and scale to bare metal in just minutes! SPECIFICATIONS: Overall size - 48"w, 30"d, 71"h. Work area - 46"w, 28"d, 34-1/2"h. Two full-size 11 gauge steel side-loading doors with welded angle-iron framework. 20 gauge steel body. Requires 10-15 cfm @ 80 psi. 125 psi max. 5 ft vac hose & Vac-50 HEPA Vacuum System with powerful brush-type 115 volt motor pulls 90-100 cfm. Fully Assembled. Crate Size: 56"w, 34"d, 76"h. Ship wt: 425 lbs. IN STOCK - Ships Quick - within 24-48 hours! Made in USA! 90-Day Trial, 5-Year Limited Warranty - Try our cabinet in your shop for 90 days. If you are not 100% satisfied, return the unit for a full refund or credit, less freight charges. 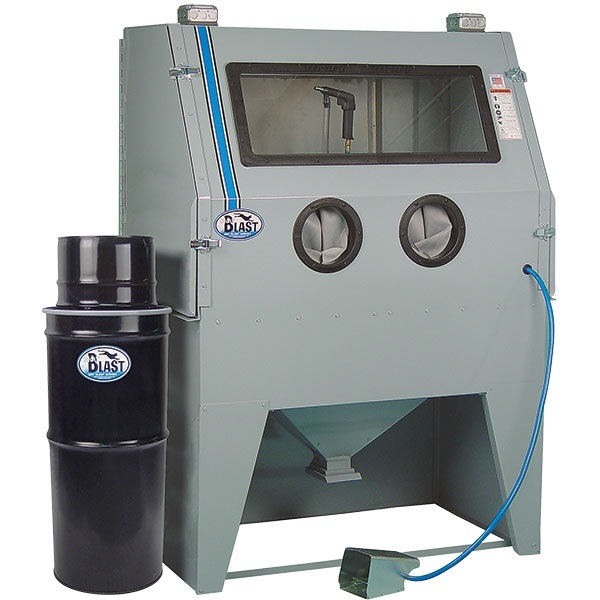 We have sold thousands of units on this basis and believe that once you try our abrasive blast cabinet, you will LOVE IT! Cabinet and power gun carry a full 5-year warranty. Wear items such as nozzles, air jets, lens, gun suction head, hoses, gloves, etc., are not guaranteed. Vacuum motor is guaranteed for 90 days from date of purchase. Ship wt 425 lbs motor freight. Unload or Liftgate Service is available for this equipment (extra cost, in addition to freight adder). Click on Unload or Liftgate Service in suggestions below for details. For commercial or shop use, or if you plan on using your Model 966 or larger cabinet more than an hour a day, we recommend our 180-DC Dust Collector. Call for additional cost and to order. I mostly do small parts, but occasionally I have larger items. This cabinet has the room. Setup is easy. Put it where you want it, plug it in and connect the air. The standard lighting is ok and will get the job done, but recently ordered the 33" mag mount LED light. You cant have too much light. I would recommend you also order the Tungsten blast tip. The standard included steel tip last minutes, so it seemed, and I misplaced the ceramics that came with the cabinet, so I was down for 2 days. Service & Delivery comments: The delivery company communicated well and the driver was willing to do what ever to make the delivery easy, which is important if you are delivering to a residential address like I did. Service & Delivery comments: I ordered over the phone instead of online because I had some questions. Julie, the sales person, was really helpful and answered all my questions and recommended several different items that would work better (you should have told me about the air duster - got it later and works like a champ).Delivery was fast and the driver was great. I've had to pay for "lift gate service" ordering other items and it was just that. Left just off the life gate. This time they would have put it in the garage but we wanted it just outside so we could get it out of the BIG crate. No damage, no fuss, no muss. Two thumbs up!! I think this is a necessary addition. It is easily installed and really improves visibility to my project. Fast shipping. Light is brighter than spots. Easy to install. If you formerly had spot lights then you can use the access point for the spot light and direct wire it into the box. Otherwise you drill an access point and use the seal supplied with the new light. It comes with a plug reattached if you don't want to direct wire it. I bought this light for a cabinet that had 33.5" internal clearance. Thought I would have .5" to spare. I did not. 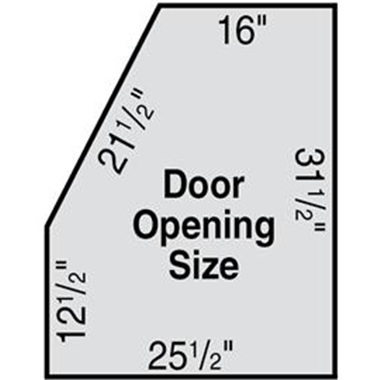 Overall, it measures 33.75" and the order comes out of one of the ends, hence, you need at least 34" clearance to install. I ended up installing it diagonally, less than perfect install, but it works. Otherwise, nice light -- hope TP will correct their specifications. TP Tools response: The light is called a 33", but overall length as stated on our website and in our catalog is 34". I purchased this light along with a new 940-DLX blast cabinet. I removed the flood light and wired this light in place of it. Very good lighting and high visibility through out the cabinet. There is no extra heat generate by this light as with the flood lights. I only used the sifter screen so far, but the other items in this kit appear to be the same high quality parts used on the blaster cabinet that I purchased. Service & Delivery comments: Packaged and placed very well within the cabinet unit, purchased together. This is a good maintenance kit and has all the essentials you need to keep your cabinet and blast gun in good shape. I have been buying this item for yaers and the quality is excellent. This is a great product. This order was for restock. I use this mainly to blast carburetor parts. Service & Delivery comments: Delivery was prompt and everything was in order. We are in the Automobile Restoration business and this media works great! It's safe for most materials and cleans nicely. Used these beads for years in my blaster, they do a great job and are long lasting. The price of shipping is worth it to me as these isn't any place local to get quality beads. Service & Delivery comments: Always been delivered quickly. First let me say I have been happy with TP and still order a lot from them, but these fitting's will not stand up to heavy use, I spent $150 switching my whole shop over and the couplers repeatedly fail from daily use, they may be OK for hobbiest but not everyday, just threw them all in the trash and went back to Milton after a year of frustration. We get much more flow for our Sprayer. Seems to be a great product. Service & Delivery comments: Received very fast! I replaced all the connections on my hose leading to my Ingersol Rand 1/2 impact and the improvement was unbelievable. So I ordered more ends to change all my tools and hoses over to high flow. I am very happy! Works great. Serves my needs. You have to shake out media quite a lot. It is heavy duty. Pretty good piece. When I purchased this I invisioned putting bolts and hardware in the can and blasting it. It seems easier to blast the parts out of the can and put the pieces inside when clean, then turn the can sideways to get the blast media out of the can. Works well either way. Service & Delivery comments: Quick delivery and no back orders. Basket is great for blasting small items and also for cleaning and washing them. Keeps them from getting lost. Very well made but handle is very uncomfortable on basket. Had to rivet a piece of 1" PVC pipe on the underside of the handle to make it easier and more comfortable to use. Service & Delivery comments: Items where shipped and arrived in a very short time. Packaging was very good and everything was received in good condition. I would recommed this blaster to others . I yous this to clean any parts I can get in it. so much nicer than seating up my sand blaster and then the clean up. Worth every penny. I had a tough spot as far as truck access to unload so instead I had the truck pull up in front of my house. Backed my trailer up the the lift gate and just transferred the load over to the trailer with the pallet jack the truck driver had brought. Both times I used this service the truck driver did all of the work. So easy, then I just pulled the trailer into my shop and unloaded with a hoist! Truck was there on the scheduled day. Unfortunately when they set up the day they can't narrow it down so it's between 8:00 AM and 8:00 PM. I guess the reason for this is because of where the local dispatch center is from your location. You could be first or last off the truck. I did get a thirty minute call prior to the delivery, which means you can run some local errands. Service & Delivery comments: Truck driver put the lift gate level with my trailer and rolled the 60 gallon compressor on to it. He was very helpful. I had him load the trailer so I could take it to my shop in the backyard. TP Tools response: Most truck lines offer liftgate service. If unavailable in your area, we will gladly refund the charge.